Slow Roasted Heaven (and tomatoes) | Says who?! How many times have you found yourself groaning “GOD, these tomatoes taste like cardboard!”? What?! Never? Maybe it’s a New York thing. Maybe it’s a Barton thing. Maybe it’s just my dad? You get the point, though, right? 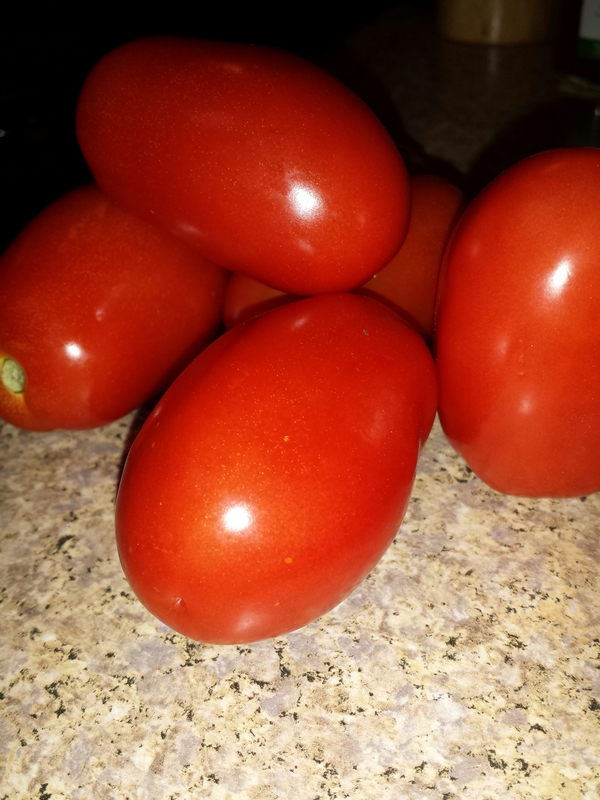 When tomatoes aren’t in season (or when you live in Florida), they taste like… nothing. So maybe the “cardboard” designation is a bit of an upgrade. Double whammy here: It’s “winter” and it’s Florida. That means one thing: crappy tomatoes. I mean, total crapola. I realize you don’t all love this beautiful ruby red gem of a veggiefruit as much as I do. But you do kinda miss the slightly tangy, sweet lusciousness of the lycopene bomb known as a tomato in the dead of the winter, don’t you? I can’t help you make an amazing BLT in January (or any other time – unless you’re willing to forgo bacon and just have an LT), but I CAN fix your other tasteless tomato woes. Bonus for the rest of the year: You’ll never have to drop another dime on store bought roasted tomatoes. That’s right, I’m gonna show you how to roast your own. The good news is, it couldn’t be any easier. The even better news? Your kitchen will smell like heaven for an entire day. Please be sure to have other good eats on hand so you don’t start gnawing on your oven – these babies take some time to cook. So, go to the store. Buy a bushel of roma/plum tomatoes (I always wanted to say “bushel” somewhere it’d make sense). Crank up the oven to 225. Get ready to change your life. Preheat your oven to 225 degrees. Cut your tomatoes in half lengthwise. Leaving as much of the flesh in the tomato as possible, scoop out the seeds and discard (or eat!). If you’re using cherry or grape tomatoes, don’t worry about the seeds – leave them in there – just cut the tomatoes in half. 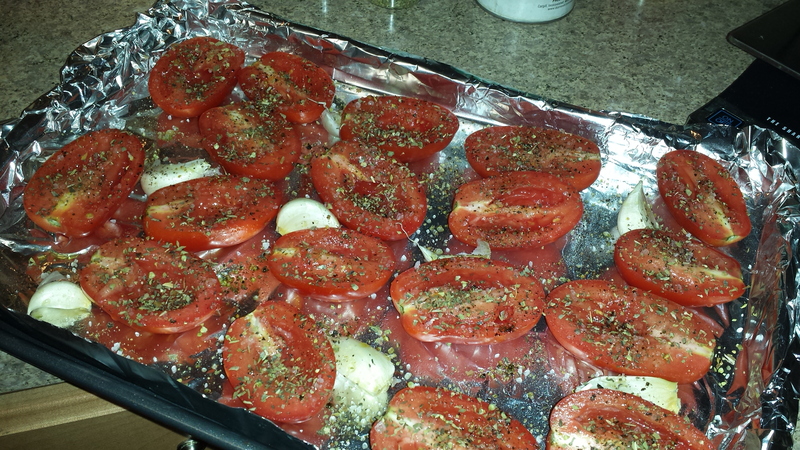 Put tomatoes cut side up on a baking sheet. Drizzle with olive oil (or mist them with your Mr. Misto, the best kitchen gadget creation in the history of ever). Place garlic cloves sporadically around the pan, unpeeled. Season lightly with salt and pepper. If using herbs, add them now too – but hear me out: use them sparingly. 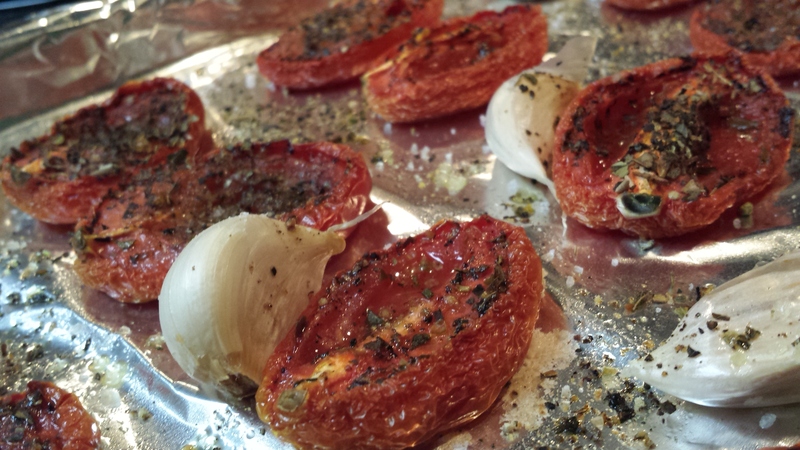 The tomato’s flavor gets so concentrated and beautiful when you roast, you don’t really NEED to add much to it. To each their own. Put the tomatoes in the oven for at least three hours, depending on the size of your tomatoes. I left mine in for four hours. You want them to get wrinkly and somewhat shriveled, but not completely dried out. Success! Wipe your mouth – you’re drooling. That’s it. You’re done. Enjoy! 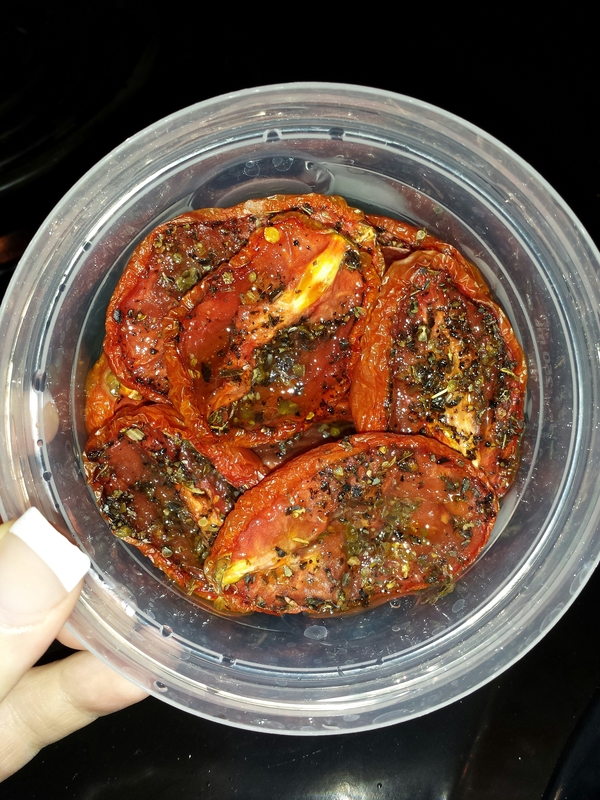 If any tomatoes make it past your soup, salad, pasta, quiche, or fingers, toss them in a baggie or container with some olive oil and they’ll keep in the fridge for up to a week. Aren’t you glad you can actually enjoy tomatoes year-round now? You’re welcome for that. When I made the pictured batch here, they didn’t even make it to the fridge. I tried – earnestly – to get them there. But honestly, I don’t know why I even bothered putting them in my trusty Ziploc container. They all got right in my belly. Here’s one of my secrets: I never throw the garlic away. Are you kidding me?!?! It’s beee roasting away, practically begging me all afternoon to eat it. So it’s a little dry – I don’t care. The skin comes right off after being in the oven so long. I just plop one whole clove on top of one of the tomatoes, and down the hatch it goes! Don’t worry – the garlic isn’t strong any more, the low & slow heat mellows it out like crazy. You won’t be mellow, though. You’ll flip. Because these little treats are friggin’ fantastic. P.S. For you Dolce Diet devotees, this recipe is completely approved – and would be a fantastic addition to your chili, pastas, wraps, and salads!